We love dishes like this! So cheap and easy yet tastes of Italian holidays. Try and find some good Italian sausages as they tend to be really well flavoured. Wine Suggestion: the fresh and pure fruited Rocca delle Macie Chianti Vernaiolo was our successful match with this. With no oak this is a delicious expression of cherry fruited flavours that celebrates the freshness of the dish at the same time. Run a sharp knife down each sausage and remove the meat from inside the casing. Crumble roughly with your fingers to break it up a bit and set aside. Over a medium-low heat, fry the onion in the olive oil with a small pinch of salt until soft but not browned. Add the chilli and sausage meat, crumbling it with your fingers, then fry, breaking the pieces up with the back of a wooden spoon until the meat is no longer pink. Add the peppers, another pinch of salt and cook, stirring every now and then, for another 10 minutes. Add the tomatoes to the pan and cook for another 15 minutes or until the sauce is rich and thick and the peppers are very soft. Meanwhile, cook the pasta in boiling salty water until al dente. Warm a large bowl, then mix the cooked pasta with the sauce and the grated Parmesan before serving. We were in a local Italian restaurant just after Christmas and tasted these amazing sausages. When we asked where we could get them the waiter said they import them direct from Siena but the chef might let us buy a few. So we now have a stash of them in the freezer and this is the first recipe we’ve tried. If you live near a good Italian restaurant we highly recommend you try and blag some sausages off them. If you can’t get good Italian sausages get the coarsest ones you can find for this. Not exactly virtuous but comfort food at its best. Cook the cabbage in boiling water for 5 minutes, then drain and refresh in iced water. Drain well again and spread out on a tea towel. Heat oven to 180C/350F/Gas 4. Put the sausages in a saucepan with the oil and heat gently. Stir in the tomato puree and 5tbsp water, season and cook over a medium heat for 10 minutes. 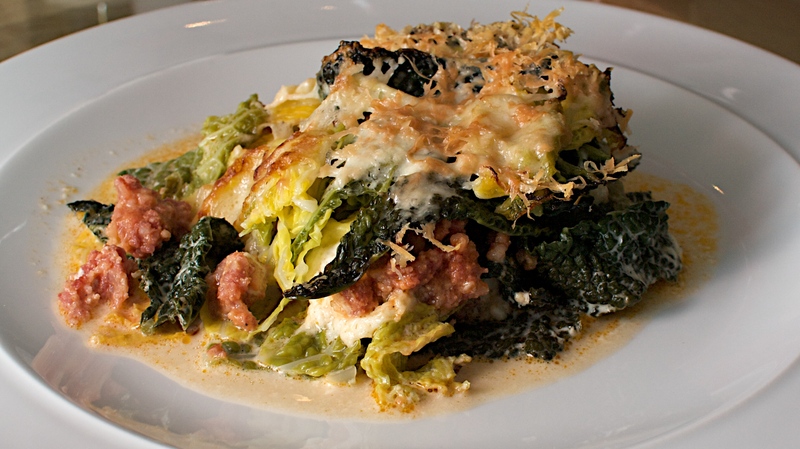 Make a layer of cabbage in the dish, season, add a layer of mozzarella, add a layer of sausage, top with another layer of cabbage and season. Continue making layers, seasoning each layer of cabbage, until the ingredients are used, ending with a layer of cabbage. Pour the cream over the top, sprinkle with the Parmesan and bake for 40 minutes. Serve with some crusty bread as you will want to mop your plate at the end. Wine suggestion: We had a glass of Domaine Brusset, Cairanne Blanc 2010 which is dry, savoury and worked well but we thought it might also be nice with a dry Sherry like a Fino or Amontillado.